Our Anti-Aging Eye Gel is one of the most brilliant eye therapy products available! This product is NOT to be underestimated. Never before has such rapid, deep and thorough regeneration been experienced in the realm of personal care products. 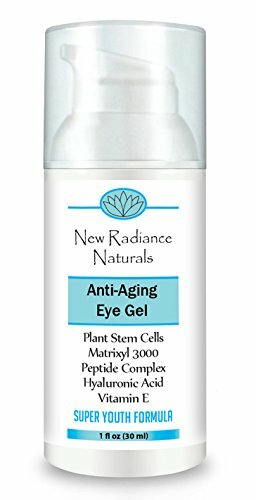 Plant Stem Cells in New Radiance Naturals Anti-Aging Eye Gel are the ultimate breakthrough for restoring and maintaining the skin around your beautiful eyes. And Matrixyl 3000 has been shown to be highly effective at reversing chronological aging, restoring skin radiance and reducing wrinkles. And our eye gel is made in the USA in our advanced FDA registered facility. - 365 Day, No Questions Asked, Money-Back Guarantee. - 100% Satisfaction or Simply Contact Us For A Full Refund. Order Now While It's Still In Stock! There's No Risk, So Don't Wait! Get Yours Today! PLANT STEM CELLS RESTORE AND PRESERVE YOUR BEAUTIFUL EYES! These plant stem cells are essentially immortal; hence longstanding anti-aging codes have been cracked overnight. Whatever your skin needs right now is exactly what this raw material will provide. IT WORKS! This formula addresses dark circles, bags, lines, crows feet, wrinkles, sagging, puffiness, loss of tone, resilience and youthful suppleness - it's all taken care of in this incredibly potent yet delicate and light gel. BEST NATURAL AND ORGANIC INGREDIENTS - 100% CRUELTY FREE! We use only vegan, cruelty-free formulations containing natural/organic active ingredients. No parabens, no sulfates, no gluten, no alcohol, no phthalates, no animal testing. MADE IN THE USA! Our 100% Plant-Based Formula Is Made In Our Advanced FDA Certified Facility. If you have any questions about this product by New Radiance Naturals, contact us by completing and submitting the form below. If you are looking for a specif part number, please include it with your message.